In Project 10471 we at the Chodera lab are looking at Src kinase. The Src gene was first discovered as responsible for the tumorogenicity of Rous sarcoma virus. This gene is also present in animals, and it is in fact a mutated Src gene that is injected back into the host that causes cancer, not a viral gene. The discovery that cancer was a result of mutated naturally occuring genes and not viral ones was a milestone in cancer research and Harold E. Varmus and J. Michael Bishop were awarded the Nobel Prize in Physiology or Medicine for this and related discoveries of the cellular origin of retroviral oncogenes in 1989. Since then Src has been found to be over-expressed and/or highly activated in a variety of cancers, most notably linked to metastasis in breast, prostate, and colon cancers. The drug dasatinib of Bristol-Myers Squibb (Sprycel commercially), has been approved for treatment of CML (described more fully in our blog post on Abl kinase), but it was also recently in clinical trials for metastatic prostate cancer due to its affinity for Src kinase. We are not only interested in Src kinase for its intrinsic value, but also to compare and contrast its behavior with Abl kinase in Project 10472. 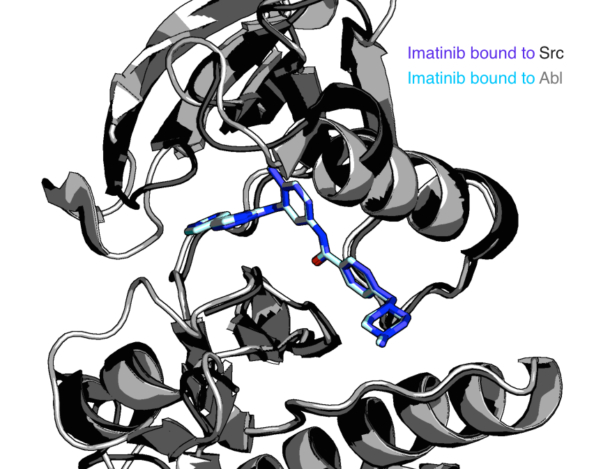 While dasatinib targets both Src and Abl kinase, only Abl and not Src is sensitive to the drug imatinib, despite the nearly identical imatinib bound poses seen in the Src and Abl crystal structures (pictured). Because these static structures are so similar, we are looking forward to using the long timescale simulations of these two kinases on Folding@home to help us understand their different small molecule binding properties.